Midwest Old Threshers Reunion is a very unique event in Mt. Pleasant, Iowa. 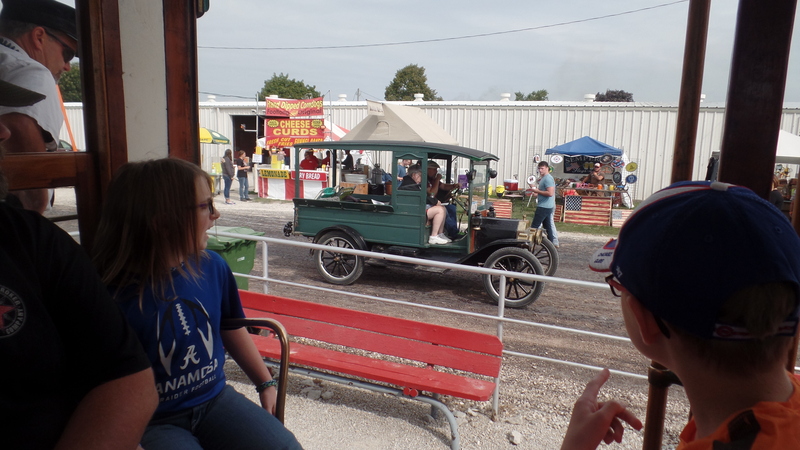 There are other “reunions” where people bring steam traction engines, tractors, and small engines to show them off and have a good excuse to get them out and play with them. However, Mt. Pleasant’s event has a broad array of different events and interests gathered in one place. Besides the machinery list above there are groups for old cars, old trucks, antiques, horse teams, an active printers hall, demonstration of equipment like a veneer saw, a threshing machine, and cooking down sorghum, an antique restored steam carousel, quilts, antique dolls, button collectors, a big craft show, trains (you can ride in), trolley cars still on their track (you can ride in), a group demonstrating life in the 1840s in the log cabin village fairly seriously and a group demonstrating life in the late 19th century not so seriously (desperadoes who steal candy & dance hall girls who stay fully dressed), a children’s game area including the chance to drive an actual tractor through an obstacle course and pony rides, fair food, big country music shows, and a theater museum mostly devoted to the traveling shows of the mid-19th to early 20th century. Come visit every year on an expanded Labor Day Weekend. This year it’s August 29 – September 2, 2019. With all this going on the reunion continues to burst at the seams, but that’s only one week a year. They have a whole bunch of other events through the year. This isn’t their full schedule, but these are the ones I think you might find interesting. One of the departments of the organization is a traveling theater museum. It covers things like tent rep, opera houses, show boats, and Uncle Tom’s Cabin shows. How to drive a steam engine like those used to work threshing machines. They are only offering one class this year. Learn how to drive a trolley. The event is for doll collectors and those interested in dolls. There are speakers on various topics, everyone gets a gift doll, and there are vendor tables. My post about the year they did a Laura Ingalls Wilder theme is one of my most read. 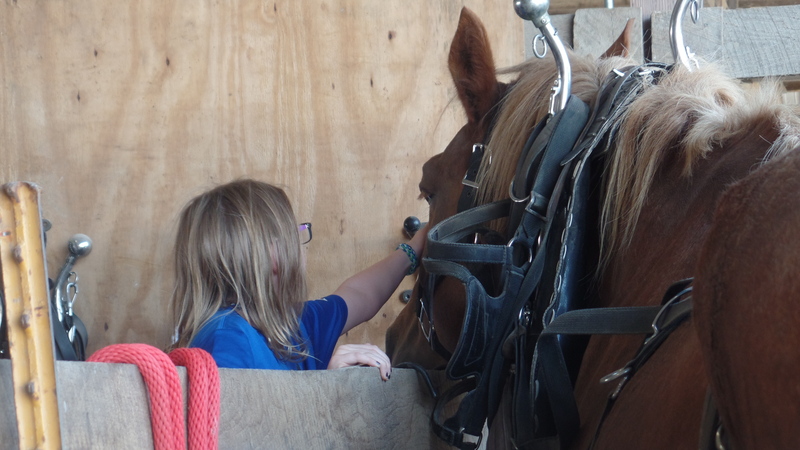 A county fair like the one the James Wilder family attended in Malone, New York. July 26-27, 2019 at 7:30 p.m. July 28th at 2:30 p.m.
Every summer they once again put on one of the plays once popular with traveling theaters to give you a taste of late 19th/early 20th century entertainment. It is specifically geared to people practicing or curious about letterpress printing for letterpress printers, from beginners to professionals. They use the extensive collection of printing equipment gathered in the printing part of Museum B. If you want to know about how they ran the paper in De Smet or how Carrie helped run a newspaper this would be a great event to plan for. They also run events every year for Halloween when the Midwest Haunted Rails shows you a ghost of a good time and for Christmas when you can take the North Pole Express to visit Santa Claus. Dates are set later in the year. I hope you come and visit Mt. Pleasant for the best reunion anywhere or any of their other great events. Midwest Old Threshers Reunion is a very unique event in Mt. Pleasant, Iowa. There are other “reunions” where people bring steam traction engines, tractors, and small engines to show them off and have a good excuse to get them out and play with them. However, Mt. Pleasant’s event has a broad array of different events and interests gathered in one place. Besides the machinery list above there are groups for old cars, old trucks, antiques, horse teams, an active printers hall, demonstration of equipment like a veneer saw, a threshing machine, and cooking down sorghum, an antique restored steam carousel, quilts, antique dolls, button collectors, a big craft show, trains (you can ride in), trolley cars still on their track (you can ride in), a group demonstrating life in the 1840s in the log cabin village fairly seriously and a group demonstrating life in the late 19th century not so seriously (desperadoes who steal candy & dance hall girls who stay fully dressed), a children’s game area including the chance to drive an actual tractor through an obstacle course and pony rides, fair food, big country music shows, and a theater museum mostly devoted to the traveling shows of the mid-19th to early 20th century. Come visit every year on an expanded Labor Day Weekend. This year it’s August 30 – September 3, 2018. How to drive a steam engine like those used to work threshing machines. These are two separate classes, one in April and one in May. July 20th & 21st at 7:30 p.m. July 22nd at 2:30 p.m. Since we are getting into a quieter time in Laura Ingalls Wilder fandom, I thought this might be a great time to revisit some of my posts with the highest all time views. Here’s the first. As of October 2013 this is one of top 10 posts of all time for the number of views on this blog. It’s rare that a week goes by without at least one hit on this post. 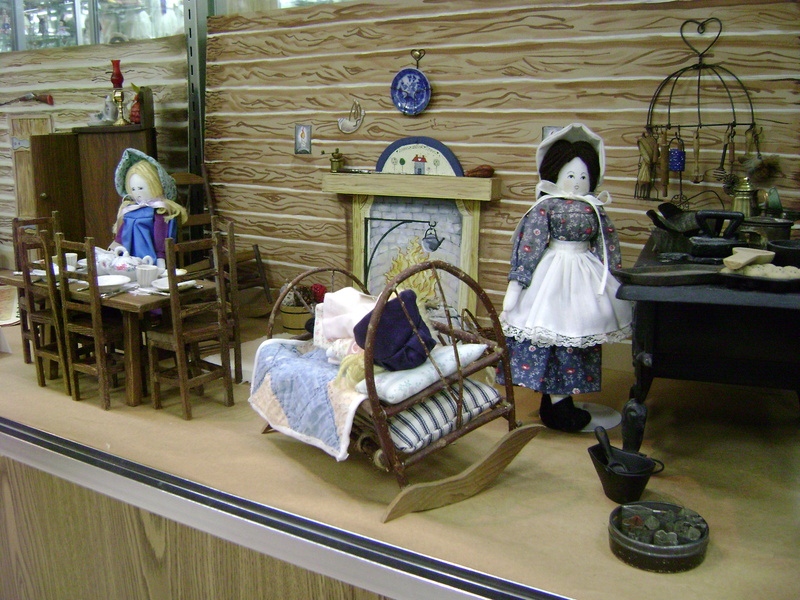 The Hawkeye Doll Club continues to host its excellent event every year with a different theme, but the basic dolls of the collection are on display any time the Heritage Museums are open on the Midwest Old Threshers Grounds in Mt. Pleasant, Iowa including a great many of the china headed dolls like Nellie owned. This program led to my crossing the Rubicon and while before this one of the few limits to my Laura Ingalls Wilder collection was not to get dolls, I was so taken by them that I have begun to collect Laura Ingalls Wilder dolls. I’ve continued to expand my Laura Ingalls Wilder: What a Doll! program that I debuted at this event as I discover new facts and find new dolls. Although it remains a dark horse, I usually still get requests for it once or twice a year and I even presented in at the 2012 National Laura Ingalls Wilder conference. While I have included other information about Laura dolls from time to time in other posts, this post remains far and away the most popular. I hope you continue to enjoy it. Midwest Old Threshers of Mt. Pleasant, Iowa and the Hawkeye Doll Club of Iowa hold an annual one day doll event. This year’s was held June 28, 2008. The subject of this year’s was “Return to the Prairie” and “Dolls of Distinction.” I previewed my new Laura program “Laura Ingalls Wilder: What a Doll” which talks about dolls in Laura’s life and fandom. Mary Kopsiecker brought in her collection of Laura dolls which include such rare items as an early 1970s Charlotte doll from Burr Oak and a china head doll purchased in Mansfield in 1981. Mary also shared information about the bus trip we took last year to Malone and a letter she would have written to Laura as a child. The Log Cabin Village deep in the heart of the camping area on the Old Threshers Grounds (but just a trolley stop away from the main action) has an original one-room log school that was transported there. In recent years they have resided and put a new roof on the structure so it no longer looks like it did when restored to its original appearance. I just learned that they are in the process of building a new school which they plan to have ready to open in time for the Reunion celebration in September 2012. I imagine this one will be built with more of an eye to traffic flow than originality, as they have complained about problems with the original over the years. The original school building will be used as “a general public building/gathering space.” The new building will become the school. Midwest Old Threshers have several one-room school buildings scattered over the grounds and even hosted the Iowa One-Room School Workshop annually sponsored by Preservation Iowa. One of them is a log cabin school in the Log Village section at the far end of trolley tracks. It’s condition The Old Threshers people have been deciding whether to repair the existing building or to start over. They feel the problems are from two problems. First, log cabins weren’t supposed to last that long. Second, when an Amish work crew reassembled the cabin in the 1980s, the room doesn’t have a proper overhanging roof. It doesn’t overhang at all on the ends, and only slightly on the sides. They’ve decided to repair the roof and add overhangs and to put horizontal siding boards on the outside, but leaving the original logs exposed on the inside. They will also rebuild the steps to the front to create a larger space in front of the entire length of the building. They intend to life the existing interior ceiling 12″- 16″ to give tails needed for the overhang. They are having the job done professionally, as they don’t have enough volunteers. Work has already started on this project, but they are willing to accept donations towards it. Thelma Kirkman shared a history quilt she made including things like square showing animals the Ingalls family knew and a secret panel with Wilder information under it. 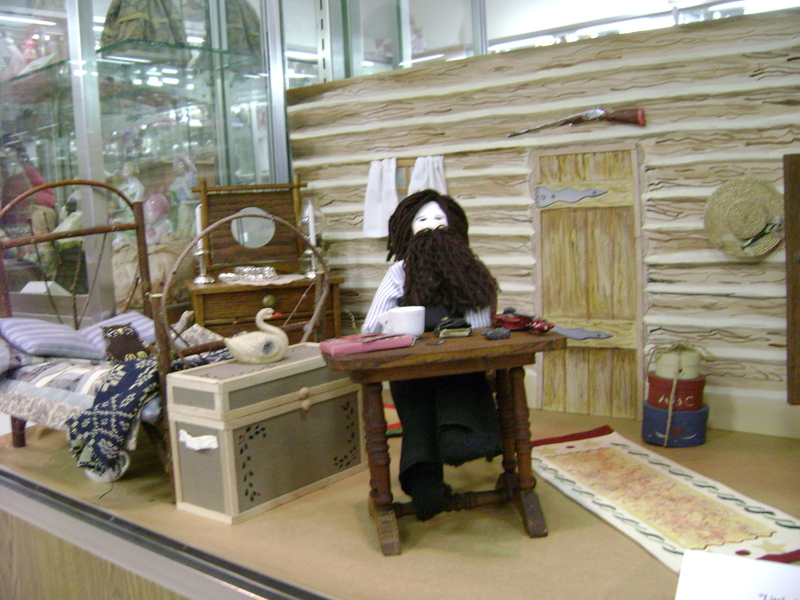 She also showed some double sided cloth dolls she made to represent the Ingalls family. The ones in their red flannel night gowns were very sweet. The afternoon featured dolls from the Bussey Collection. It was gifted to Old Threshers by Wilma Bussey who had collected the dolls and wanting to keep them together gifted them to Old Threshers which she attended every year. In the chapter “Town Party” in On the Banks of Plum Creek Laura describes a china doll. The afternoon featured talks on dolls made by 3 of the major china doll manufacturers. They all were in Germany which had a very active doll and toy industry until the World Wars blocked trade with other countries and starved them for markets. Makers featured were Kestner “King of Dollmakers”, Armand Marseilles, and Kammer & Reinhard. Glenna Voyles outdid herself putting together a display of Wilder dolls from her own collection. The highlight was the dolls made from 1975 to 2007 by Dorothy Nazarenus of Sleepy Eye, Minnesota. This stalwart of the Walnut Grove gift shop is on display in a complete background and furniture display created by Glenna’s husband. (See photos) There are also many china head dolls as part of this display and some unique dolls created to look of the era. This display will be up through the Old Threshers event which concludes on Labor Day. UPDATE: As of October 2013 this is one of top 10 posts of all time for the number of views on this blog. It’s rare that a week goes by without at least one hit on this post. The Hawkeye Doll Club continues to host its excellent event every year with a different theme, but the basic dolls of the collection are on display any time the Heritage Museums are open on the Midwest Old Threshers Grounds in Mt. Pleasant, Iowa including a great many of the china headed dolls like Nellie owned. This program led to my crossing the Rubicon and while before this one of the few limits to my Laura Ingalls Wilder collection was not to get dolls, I was so taken by them that I have begun to collect Laura Ingalls Wilder dolls. I’ve continued to expand my Laura Ingalls Wilder: What a Doll! program that I debuted at this event as I discover new facts and find new dolls. Although it remains a dark horse, I usually still get requests for it once or twice a year and I even presented in at the 2012 National Laura Ingalls Wilder conference. While I have included other information about Laura dolls from time to time in other posts, this post remains far and away the most popular. I hope you continue to enjoy it.